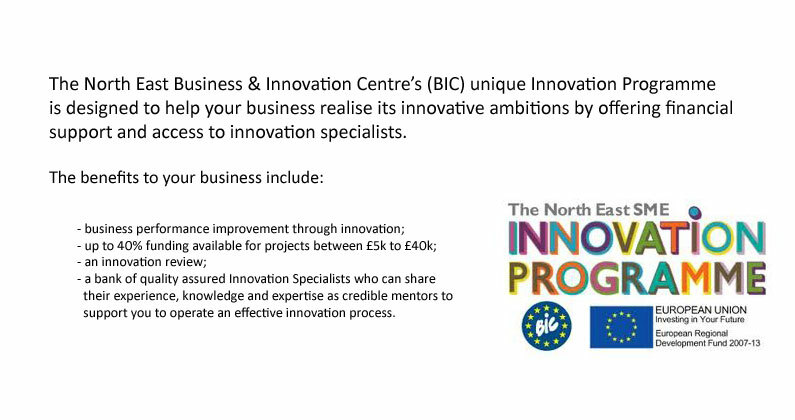 The North East SME Innovation Programme is designed to help your company innovate. Put simply we offer expert advice and support to help your business to do something new, different, smarter or better that will make a positive difference and could ultimately result in your business being more competitive or even a growth in profits. Designed specifically for SMEs the Innovation Programme offers expert help and guidance to enable you to develop and implement your innovation plans. So whether you are looking to be innovative with your products, your services or your business processes our team of internal and external advisers may be able enable you to take your ideas forward. Up to 40% funding available for project costs of between £5k to £40k depending on the project. Available to North East based B2B SMEs who have been trading for 12 months or more and looking to explore the business’s innovative ambitions.